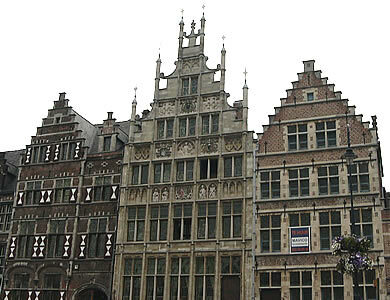 Ghent (also written as Gent in Dutch, or Gand in French) is a city in the Flemish region of northern Belgium. 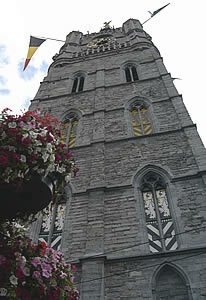 Belfort (the Belfry) is an important landmark in the centre of Ghent, and is close to the Tourist Information Centre. 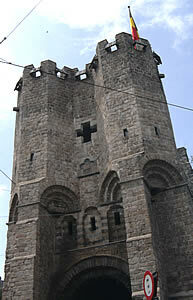 The original tower was built from wood in the 14th century, and was replaced by a stone structure in 1913. There is a small entrance charge for visitors. A stone tower keeper (dressed like a knight) was put on each corner of the building in 1339: you can see replicas in the lower part of the tower. Since 1378 there has been a dragon (made from copper) at the top of the tower. 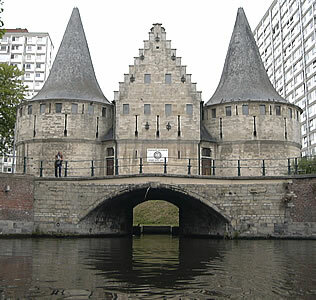 This is a symbol of Ghent's freedom and power. A dragon is supposed to never sleep, so it is always looking out from the top of the tower, protecting the citizens from danger. 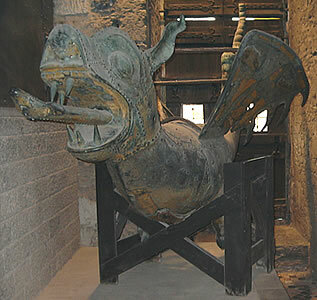 The remains of the original dragon and a later replacement are displayed on one of the floors. The chimes of its bells were used to mark the start and end of work and the opening and closing of the city gates each day. They also warned of dangers, such as the approach of enemy soldiers. 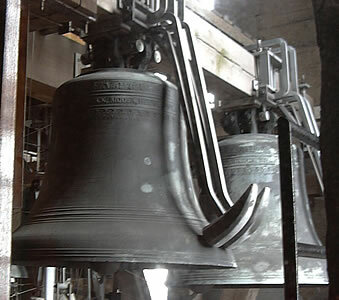 Today there are 54 bells of different sizes in the tower. 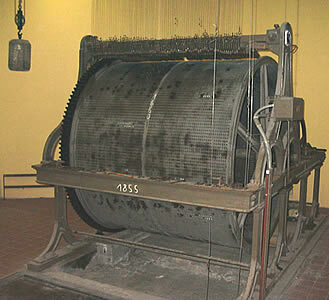 The chiming drum is connected to the main clock and sounds every 15 minutes: it works in a similar way to a music box. 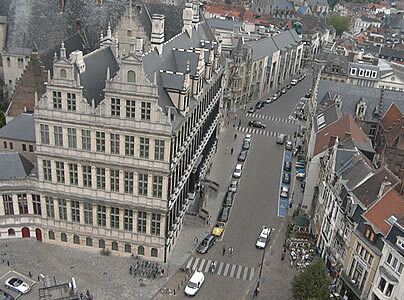 There are spectacular views of Ghent from the top of the Belfort. 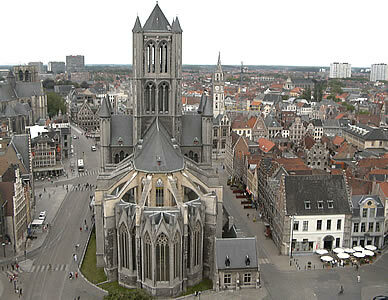 On the east side of the Belfort is Sint-Baafskathedraal (St Bavo's Cathedral), and on the west side is Sint-Niklaaskerk (St Nicholas' Church). 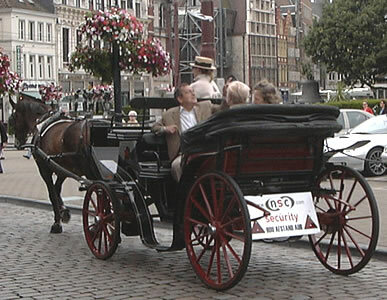 On most days it is possible to take a ride around Ghent in a horse-drawn carriage. This tour starts from the square in front of the Belfort. 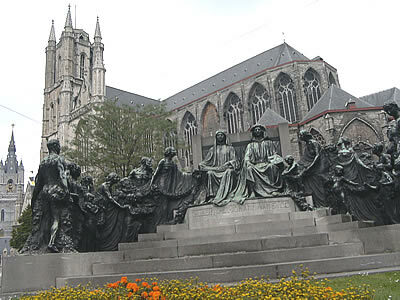 Sint-Baafskathedraal (St Bavo's Cathedral) is located in Sint-Baafsplein, one of the squares next to the Belfort. 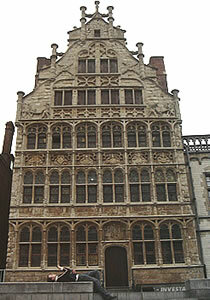 Outside there is a monument dedicated to the Flemish painter Jan van Eyck (this was created in 1913). There has been a cathedral here for over 1000 years, but most of the Gothic structure that can be seen today was built over a 300 year period starting in 1290. Entry to the cathedral is free, but visitors should be quiet and respect it as a place of worship (for the Catholic religion). 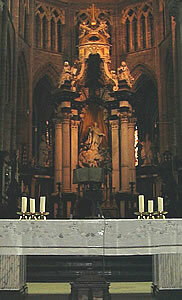 The cathedral contains a famous oil painting in 12 panels: this is "The Adoration of the Mystic Lamb", painted by Jan van Eyck (possibly assisted by his brother) in the 15th century. There is a small charge to see the original van Eyck painting. Copies are also on display: the one below shows how it looked before restoration of the bottom left panel. 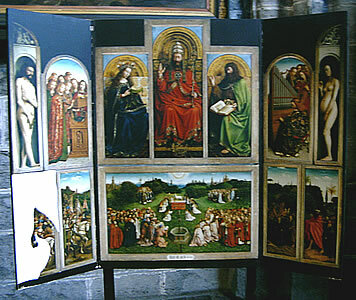 The paintings on the top row include images of God (in the centre) and Mary (the mother of Jesus), as well as naked pictures of Adam and Eve (the first man and woman, according to the Old Testament). 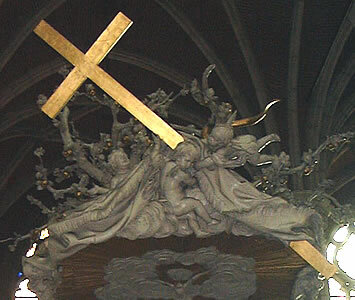 The bottom row represents the spirituality of the world: in the centre is a picture showing a lamb being sacrificed on an altar (blood can be seen coming out of its body). The paintings were originally kept near the altar: they were normally folded shut and only opened on special occasions (you should look at the back to see the cover screens which would have been visible on other days). Jan van Eyck was one of the earliest masters of oil painting, before this style became popular with Italian artists in the period known as the High Renaissance. It is worth spending some time walking around the cathedral, as the decoration is very beautiful. 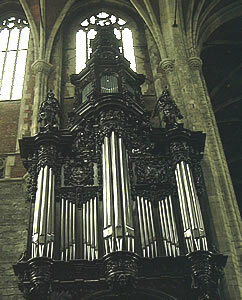 Below are pictures of the altar, pulpit and organ. Graslei and Korenlei are the main quays, and these used to be busy trading centres. Beside the edge of the water are guildhouses, each of which used to be one of the main buildings for a type of trade. These days the trading boats have been replaced by tourist boats. 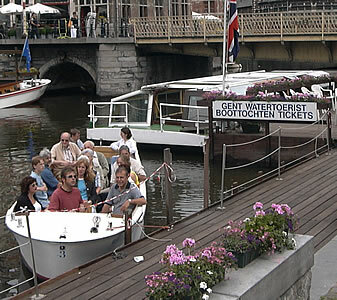 If you have time you can enjoy a 1-hour cruise around the canals of Ghent. 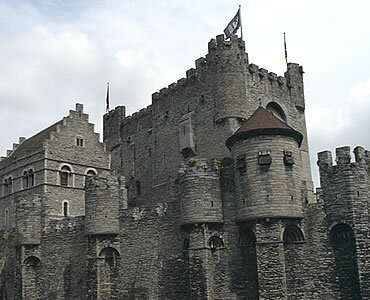 Just a short walk from the Graslei is the Gravensteen, known in English as the Castle of the Counts. This is a 12th century castle. 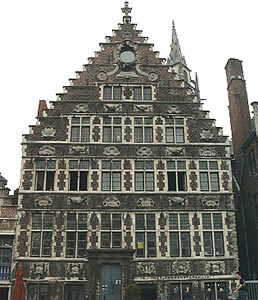 Nowadays it contains a museum containing torture equipment as well as medieval weapons and armour. There is an entrance charge. 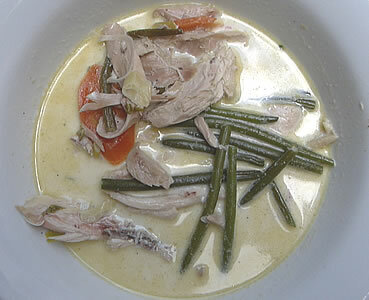 If you have time to eat a meal in Ghent, there are many restaurants in the town centre serving local specialities such as waterzooi, Gandaham, or Ghent stew. 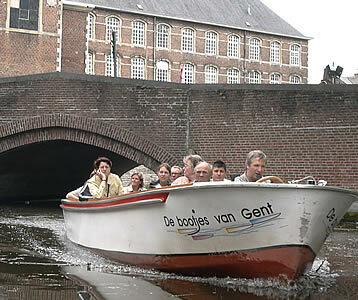 It is easy to visit Ghent by train: journeys from Brussels, Bruges or Antwerp take less than 1 hour. The station's name is Gent-Sint-Pieters. The easiest way to reach the town centre from the station is to take a tram.